The 9 Best Doughnut Shops in Nevada! 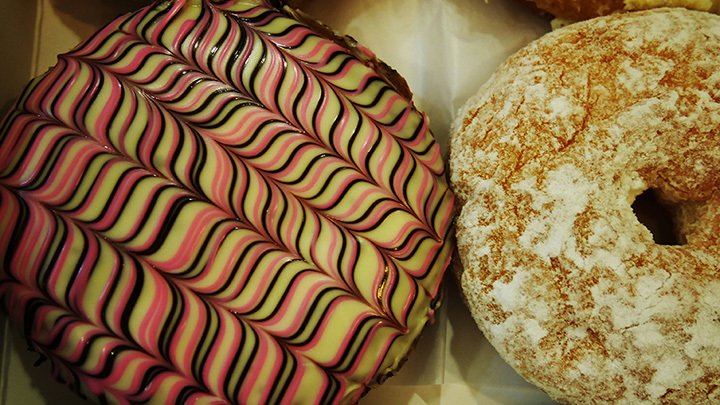 Doughnuts are about as close to the perfect sweet treat as you are going to get. They’re easy to grab on the way to work, a nice snack to share with friends, and above all, the best treat to satisfy a sweet tooth. Most people have their go to favorite. It can be anything from a wild new flavor to the standard glazed. The next time you are in the mood for the sticky sweet goodness, try one of our top nine choices for doughnuts in Nevada. A true small-town bakery, the doughnuts here are amazing. Whether you sample their famous Wolf Pack Paw or something more traditional, chances are you won't just have one. The icy goodness is worth the drive and wait in line. With 50 flavors of doughnuts on the menu, there is something for every family member. The fritters are amazing but the Party Giants are a crowd pleaser. Kids love the mini doughnuts too! Grab and go doughnuts, most people buy them by the box. Your office will love these yummy treats or they make a great weekend addition. The secret is in the frosting, it's simply divine. Some of the best doughnuts in Vegas. They are known for their quirky sense of humor and flavors that remind you of the original gourmet doughnuts at VooDoo in Portland, Oregon. Try something new and take a chance with one of their wild flavors. Need doughnuts at 3 a.m. in Vegas? These guys have you covered! They offer the classic and some fun new icing flavors 24/7. There is never a wrong “tyme” for their doughnuts. Pop culture meets the quirky doughnut in this whimsical doughnut shop. The outrageous flavors include a bacon and maple infused doughnut named the “Heaven Bacon.” If you prefer something more sassy and sweet, try the “Kim Kardoughshian.” The funny flavor names are worth the visit! A local cafe known for having fresh, warm doughnuts all day long. Locals follow the smell of fresh baked goods to sample whatever is still warm. The doughnuts are made on-site and there isn't a bad choice in the bunch. Everything is hand made to perfection. Their signature doughnut is a hybrid cross between a standard round doughnut and a flaky croissant. This is what keeps their loyal fans coming back. Made to order doughnuts are what they do best! The tastes are amazing and it is always fun to try one of their new in-house created gourmet offerings. Whether you want something filled, glazed, topped or all three, you get exactly what you want.